With the VIP (Virtual Instrument Player) software application, your entire VST library is controlled by one application. 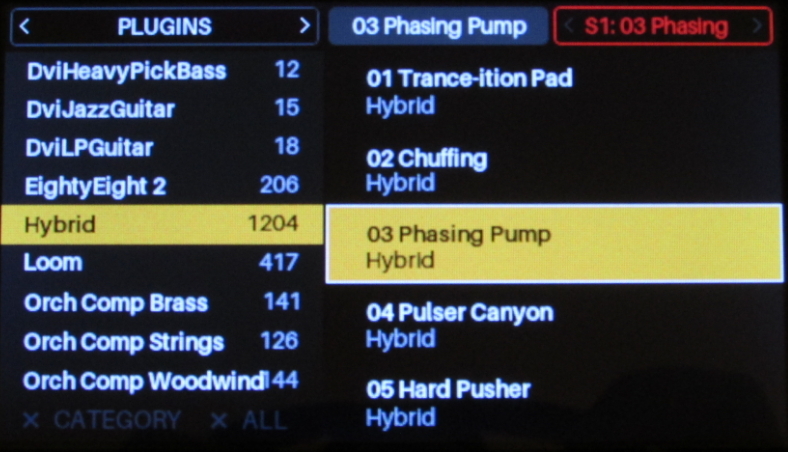 Included with the Akai Pro Advance, Alesis VX49, and M-Audio CTRL49, VIP puts automatic plugin control at your fingertips. The included videos and article walk through a number of frequently asked questions about the VIP software. Will VIP work on my computer? Do I need a Digital Audio Workstation (DAW) to use VIP? 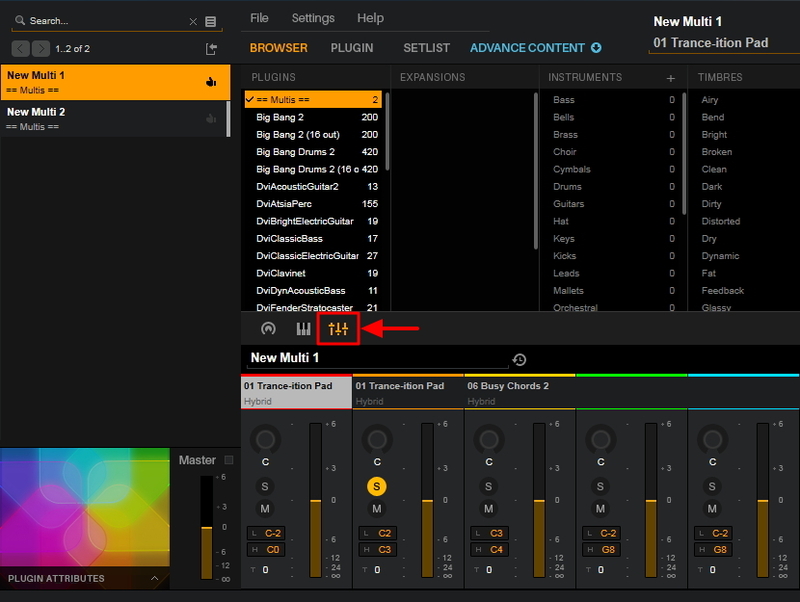 Will VIP work in my Digital Audio Workstation (DAW)? Does VIP really let me add VST instruments in Pro Tools? How many instances of VIP can I run in my DAW? Will VIP automatically tag the sound types when I add my favorite VST plugin? Can I customize and adjust the Tags in VIP? How many plugins can I use in a single Multi? What is a Set List and how do I create one? How many Set Lists can I save? Can I split the keys to trigger different patches from different areas of the controller? The installation includes both a 32-bit and 64-bit standalone application as well as 32-bit and 64-bit VST, 64-bit AU, and AAX plugin format. 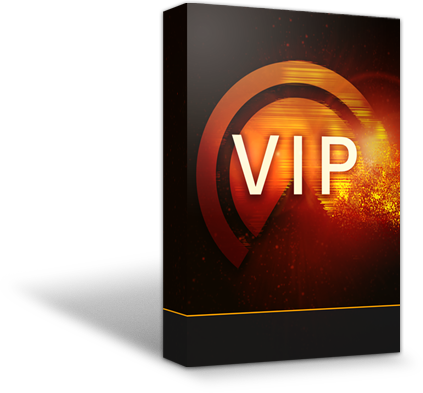 For more information on installing the VIP software package, check out the videos below. Does VIP run a standalone application and as a plugin inside my DAW? VIP is can be run as a 32 or 64-bit standalone application, or as a plugin in your favorite Digital Audio Workstation (i.e. Pro Tools, Logic, Ableton, Cubase, MPC, etc). The installation includes both a 32-bit and 64-bit standalone application as well as 32-bit and 64-bit VST, 64-bit AU, and AAX plugin format. VIP will open in most modern Digital Audio Workstation software titles (i.e. Pro Tools, Logic, Ableton, Cubase, MPC, etc). It operates as a plugin within any AU, VST, or AAX compatible DAW. The installation includes a 32-bit and 64-bit VST, 64-bit AU, and AAX plugin format. Does VIP really let me use VST instruments in Pro Tools? YES! It works as a VST host in the Pro Tools AAX environment as well as in other non-VST plugin hosts such as an Apple Logic AU environment! 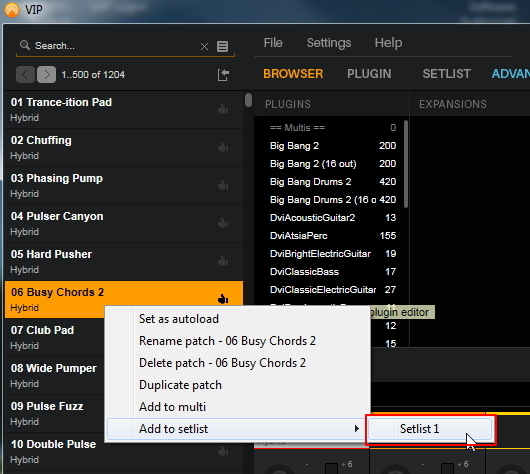 You can add as many instances of the VIP software into your DAW as you like. The only limitation is your computer processing power. There are over 400 plugins that VIP will automatically and intelligently map with as long as the Auto-tag patches preference setting is enabled - which by default, it is. You can also manually add patches and tags manually. To do so, follow the steps suggested here. Click BROWSER to enter the Tag mode. Use the filters to locate the Patch you want to Tag. Once you locate it, click on the Patch of choice in the Patch Browser on the left. You will notice that any current tags associated with that Patch will have a small checkmark just to the left of the tag. To add another Tag, Ctrl+Click (Cmd+Click) on the new Tag and a checkmark will appear next to the Tag of choice. To remove a Tag, Ctrl+Click (Cmd+Click) a Tag that currently has a checkmark next to it and the checkmark will disappear. Selecting a Patch in the Patch Browser will show the checkmarks next to all of the Tags associated with that Patch. Patches can have multiple Tags in each category. Click BROWSER to enter Tag mode. Each Category column will have a plus (+) button next to the category name. Click on the plus (+) button and enter the name of the new Tag title to be added to that category. Press Enter when finished to add the new Tag title. At any time, you can right-click any Tag and choose to remove or rename it. Note: Removing a plugin from the PLUGINS category will cause all of its associated Patches and Tags to be removed as well. Now you can add that Tag to any Patch you want. 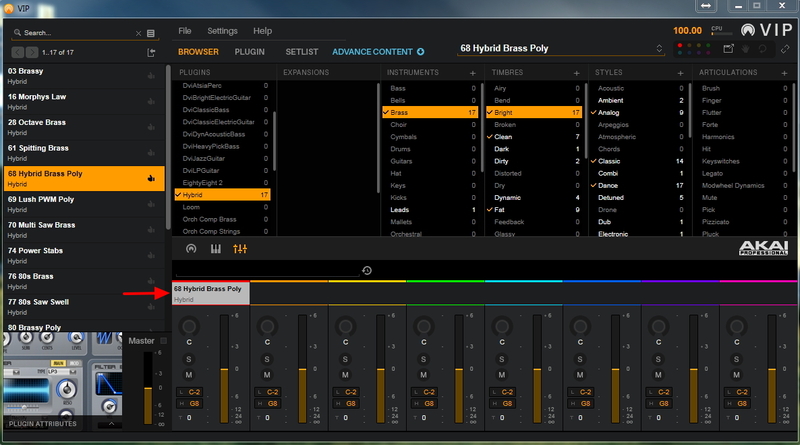 A Multi is a user-created patch that allows the user to layer up to eight patches into a single "Multi" patch which can then be mixed, panned, soloed, muted, and set to keyboard ranges/splits. In other words, it is a sort of "Patch bucket". 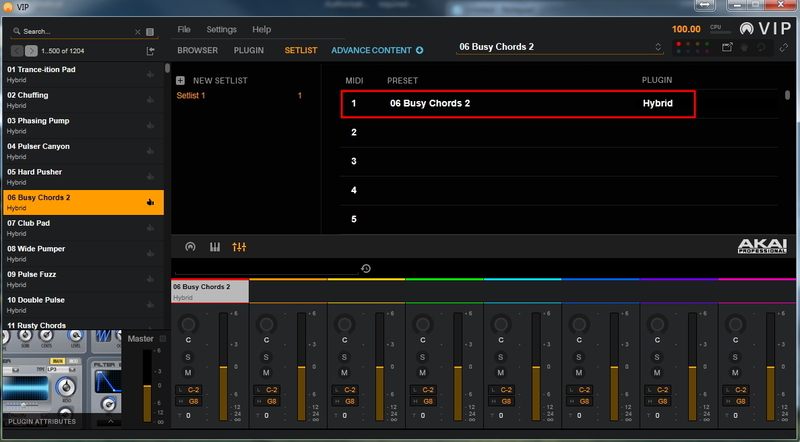 There are two ways to create a Multi - From the Advance MIDI controller itself and from within the VIP software. Press the BROWSER button. Use the Value Dial and Arrow keys to choose a patch. Press in the Value Dial to load the patch of choice. This automatically loads to Slot 1. To add a second patch to your Multi, use the Up Arrow and Right Arrow buttons to highlight the Slot (S1) area in the upper right corner of the display window. Turn the Value Dial to change to Slot 2 (S2), then press in the Value Dial to select it. Use the Arrow keys and Value Dial to select a second patch as described in step 1. Repeat the steps above to add up to 8 different patches to your Multi. Click on Browser. 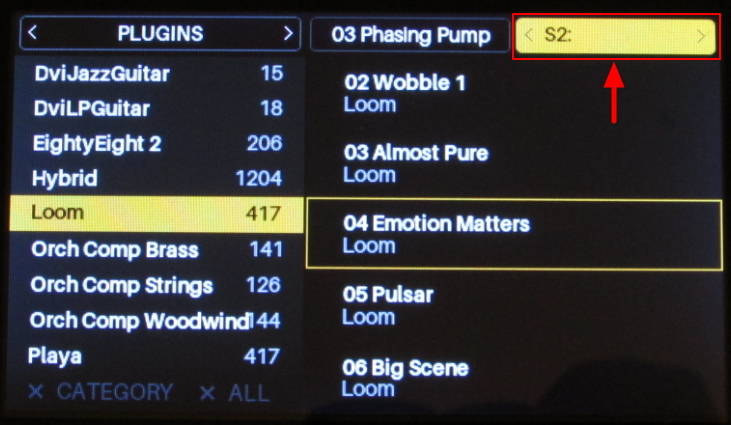 Choose your preferred VST plugin and/or tags and click on your preferred patch in the left column to load it to Slot 1. If you like, clear your current Tag selection by clicking on the circular arrow button in the upper right corner of the VIP software to clear all current tag selections. 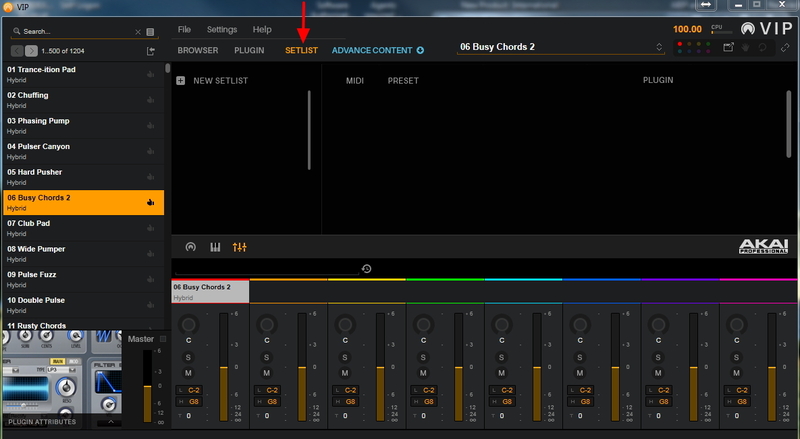 Now click on the preferred plugin or tags to locate the second sound of choice for your Multi. Click and drag the new patch to Slot 2. How many patches can I use in a single Multi? Add up to 8 patches to any Multi. Create as many Multis as you like! What is a Setlist and how do I create one? 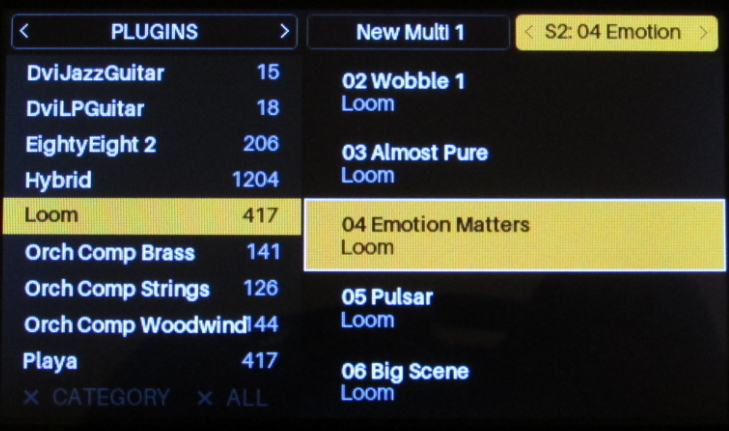 A Setlist allows users to order their patches in a “set” for quick selection when playing live or just stepping through a list of favorite patches. A Setlist must be created and built in the VIP software, but once your Setlists are created, you can access all of your Setlists and individual patches in the Setlist directly from the Advance, VX49, or CTRL49 controllers. 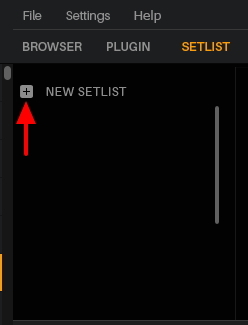 Next, click on the "plus (+)" button next to NEW SETLIST and name your new Setlist. Click on BROWSER and locate the patch you want to add to your Setlist. Click on the patch to load it, then right-click the patch. In the drop-down menu that appears, scroll over Add to setlist and then choose the setlist you want to add the patch to. At the top of the VIP window, click on SETLIST. You will notice the patch you chose has been added. In this window, you can also drag any patch of choice directly from the left column to a new spot in your setlist. Press the MAIN button to return to the main screen. Use the Arrow keys to highlight the Setlist box in the upper-right of the display screen. Use the Value dial to choose your Setlist and then use the down Arrow key to access the individual patches in the Setlist. To load a patch, press the Value dial in. The VIP software allows you to save up to 128 different Set Lists. Can I split the keys to trigger different patches from different areas of the keyboard? Yes! You can do this from the VIP software or from the Advance, VX49, and CTRL49 hardware. Choose a Multi and then open the Multi panel by clicking on the Multi panel icon. For each channel of the Multi mixer, there is a key range section. Click in one of the range boxes to un-hide the piano panel. The range for the currently selected Multi channel will be highlighted. There are two ways to adjust the key range for an individual Multi channel. 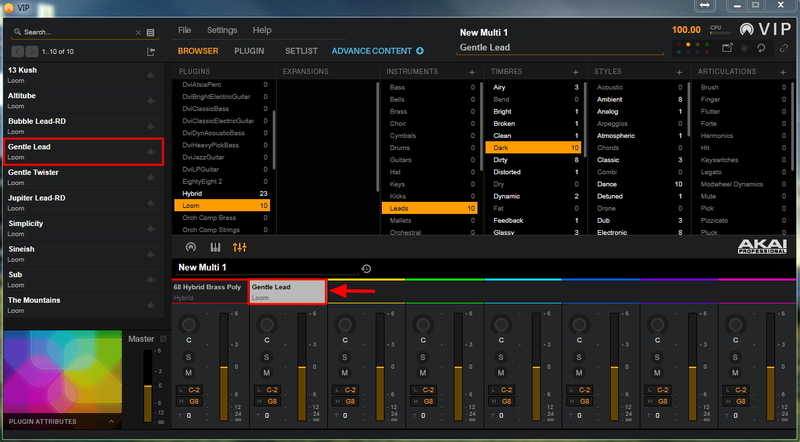 Click-and-drag either end of the highlighted range in the piano panel to your preference. Click-and-drag the Low or High key range slot boxes up or down to adjust the minimum or maximum key range value. Adjust each Multi channel to your desired key range. Choose your Multi and then open the Multi window on the Advance display screen by pressing the MULTI button. Use the value dial to highlight the Multi channel key range that you want to adjust and then press in the Value Dial to select it and view the individual parameters of that Multi channel. Use the arrow keys to highlight the Lo Key or Hi Key key range. Use the Value dial to adjust the minimum and maximum values of the key range for your Multi channel. Press in the Value dial to go back to the Multi channel window. Use the Value dial to select any remaining Multi channels that you want to adjust and repeat the steps above for each channel.